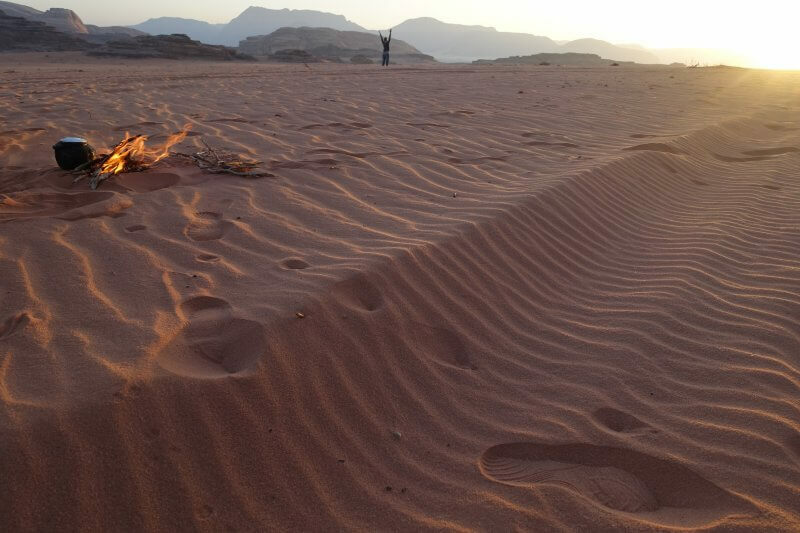 Ever dreamed of living it out in the desert, chilling in the wilderness by day, sleeping under the stars by night? How about all that, with modern day comforts such as having a bed under a sheltered tent, warm water to shower in, running electricity, along with fresh hot meals? 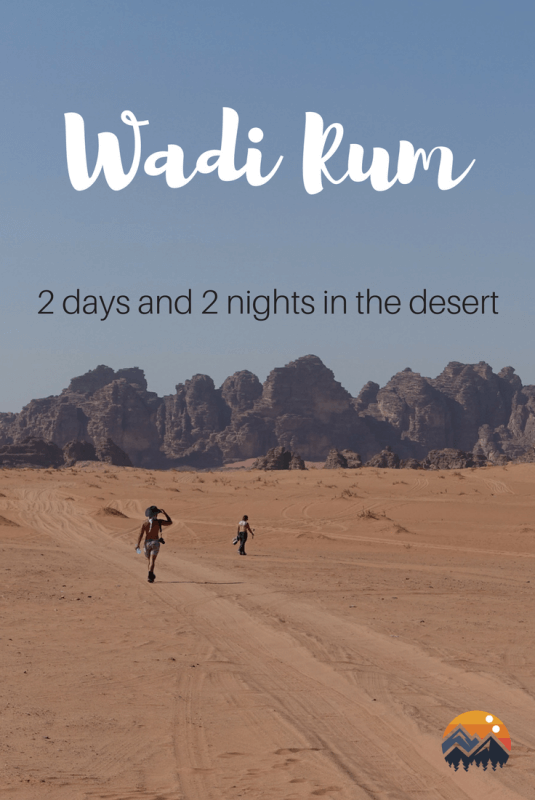 Well I discovered recently that I could do all of that without breaking the bank at any of the many desert camps in Wadi Rum, in Jordan. Read on to find out more! I didn’t had a chance to say goodbye to Issam that morning. 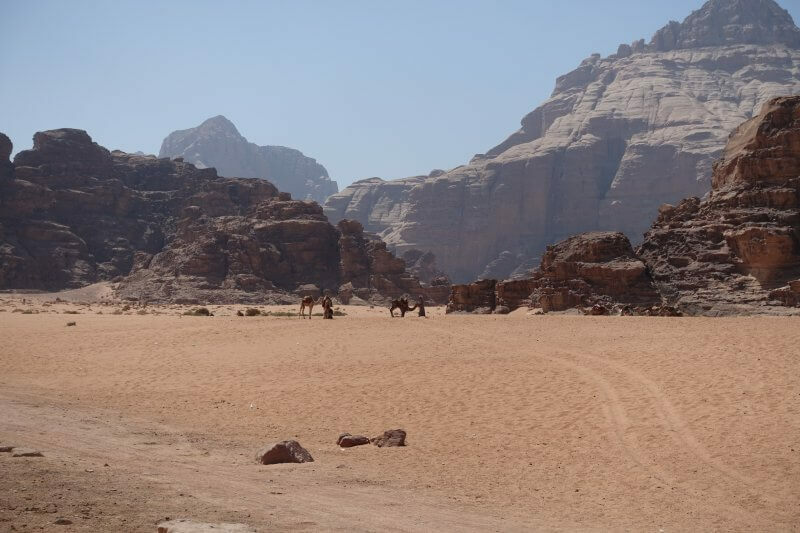 The daily bus from Wadi Musa (Petra) to Wadi Rum picks everyone up from their guesthouses/hotels around 6am. Issam, with the hospitality he had shown over my stay at his guesthouse, left breakfast all packed and ready on the counter. It was a chilly September morning. Fortunately, I didn’t had to wait long for the bus to arrive. Someone almost got left behind at Wadi Musa after their hotel didn’t confirm their pickup with the bus driver. I didn’t had to worry over such stuff with Issam in charge. 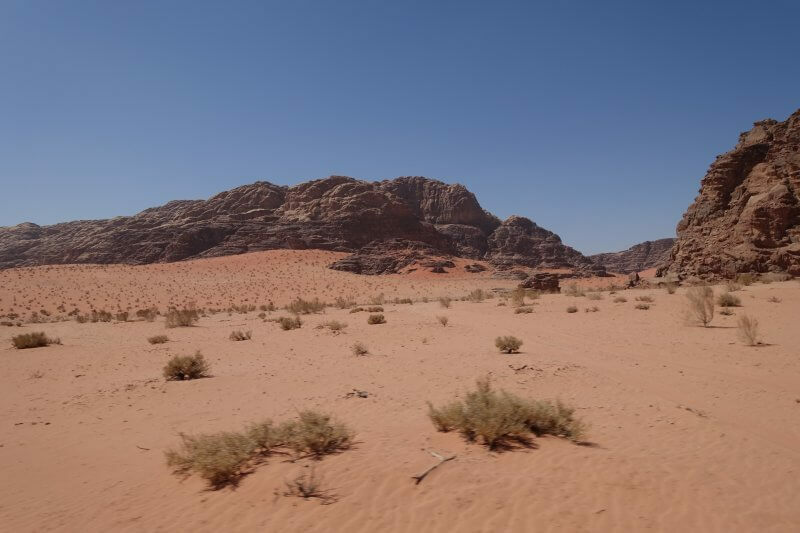 But all went well in the end, and soon everyone was on the bus, heading towards Wadi Rum. The Valley of the Moon in some accounts, the Valley of the Romans in others. 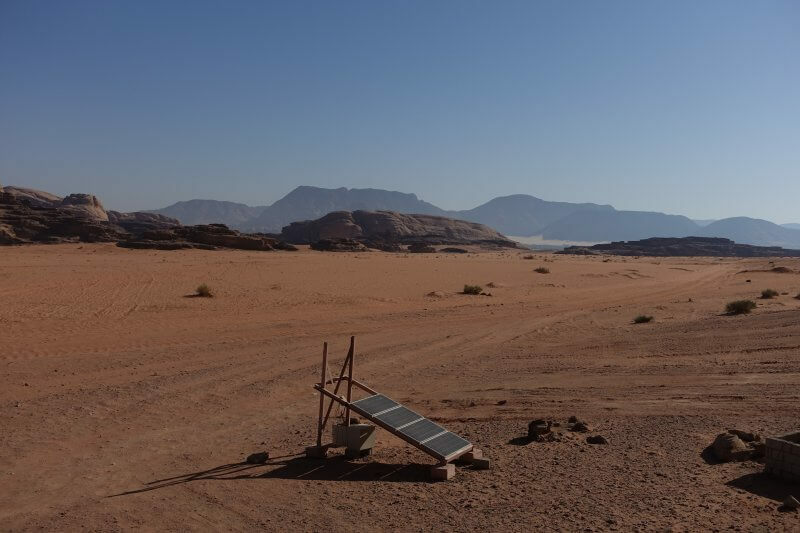 Almost 2 hours later, at Wadi Rum Visitors Center, a staff from Salman’s desert camp was waiting for me in his Toyota Hilux, as Issam had helped to arrange the previous night. The guy who came for the pick up in his pickup spoke no English. Is this Salman? Definitely did not sound like it. 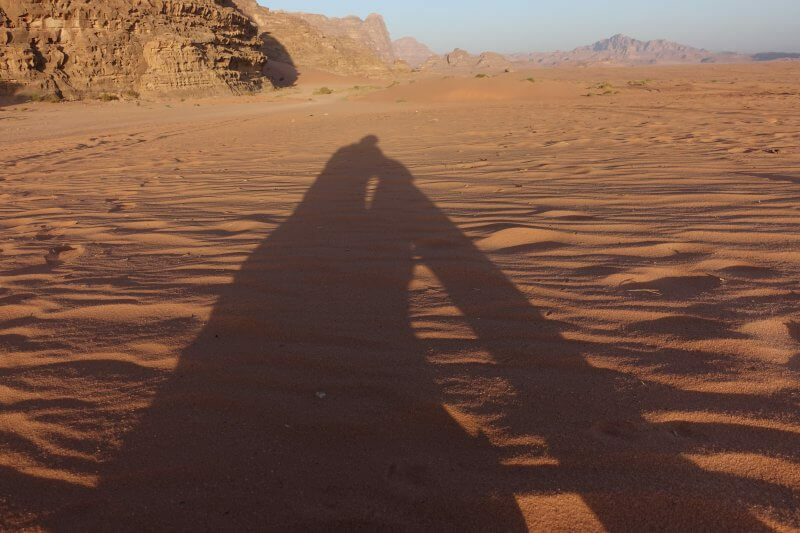 I had little choice but to trust him to take me to Salman’s camp, in the middle of the desert. I couldn’t help but start to worry if the rest of the staff at the camp spoke at least a tiny bit of English. I must admit I had been terribly lazy in picking up at least some Arabic before the trip, which is not something a seasoned traveller would do. Even in Jordan it took me a week before I understood shukran and afwan. Slow learners have much to worry about. 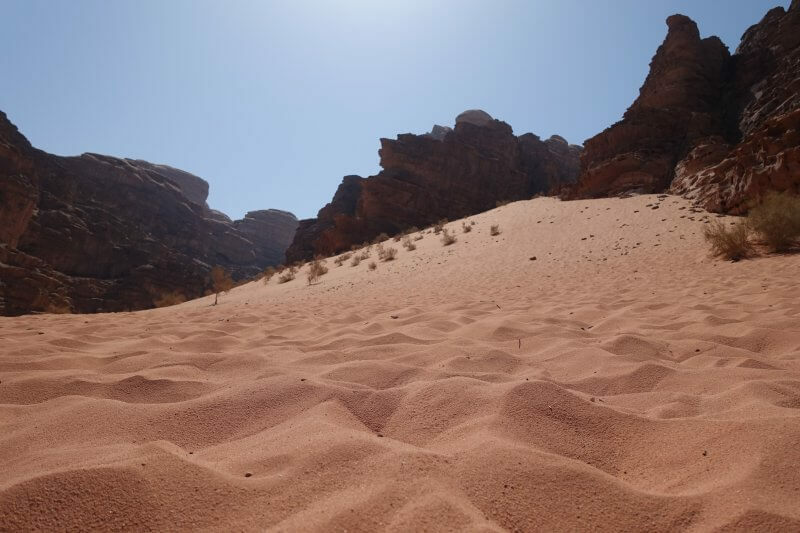 But as the pickup left the paved road for the sand tracks of the desert, the awe that filled me left no room for worry. The ‘Seven Pillars of Wisdom’. Couldn’t believe I was seeing something like that in real life, thought they only existed in movies. Salman’s camp, otherwise known as Salman Zwaidh Camp on booking.com, was like an oasis in the desert. 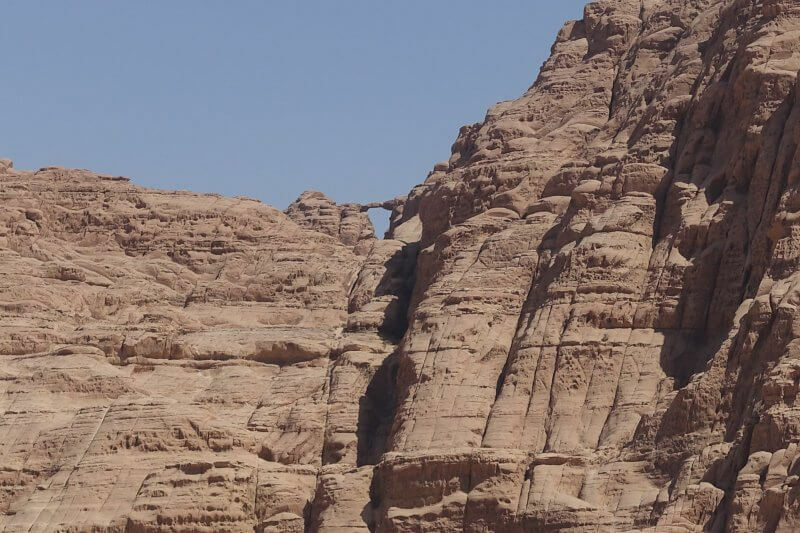 In what seemed like miles and miles of uninhabitable terrain, Salman set up a camp on one side of a huge rock (or small mountain? 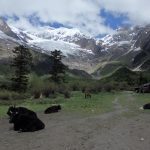 ), well sheltered from the elements, and well equipped with modern toilets, a kitchen, electricity (from solar panels, no surprise), a couple of big tents each comfortably housing double beds, but alas, no Wi-Fi. 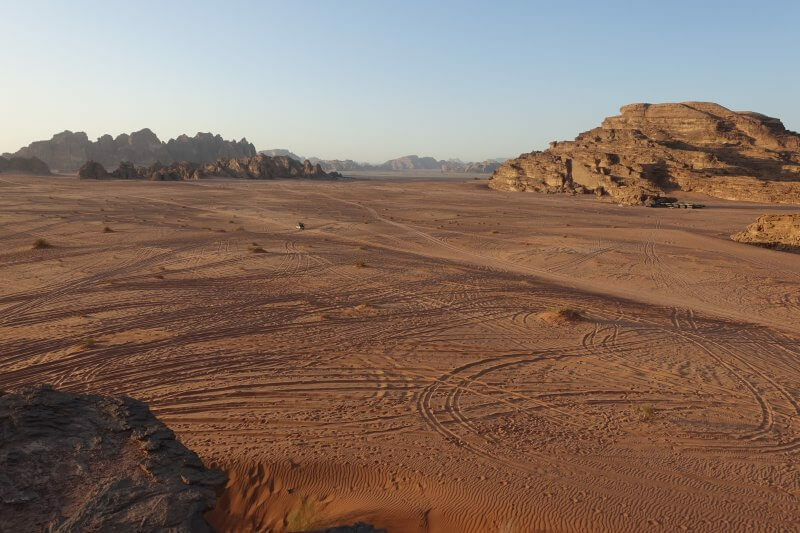 While it wasn’t the most luxurious of experiences, I was pleasantly surprised with this level of comfort out in the middle of the desert for quite an affordable price (20JD/night for a room with 2 single beds/1 double bed inclusive of breakfast and dinner). Cosy area for meals and tea. 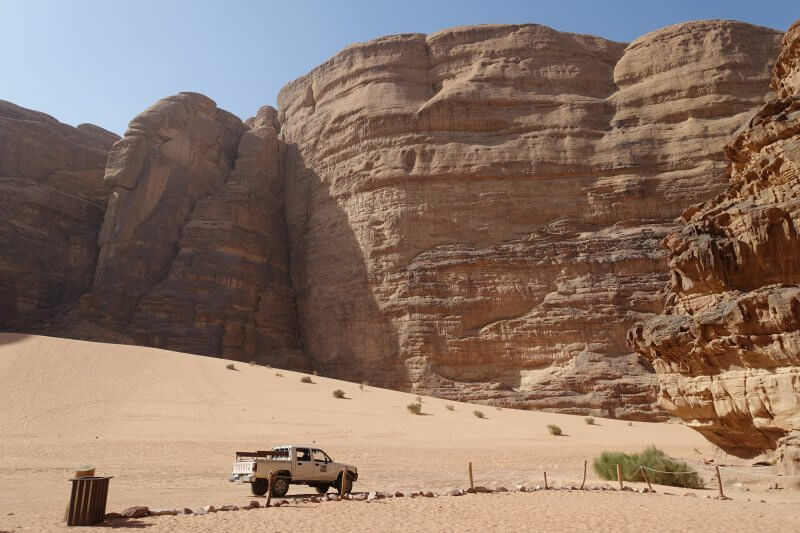 On the first day I planned to only have the jeep tour to the various sights in Wadi Rum. 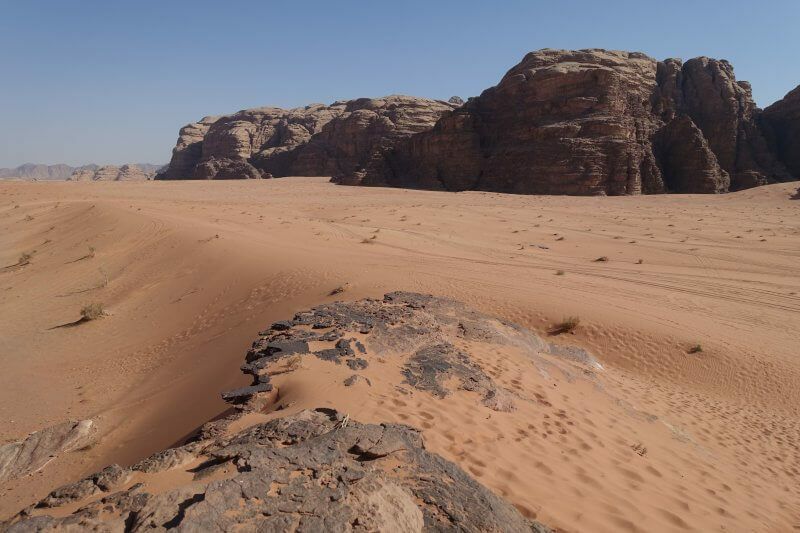 As this might be my only trip ever to the desert I decided to go with the 5 hour tour, although it is quite pricey especially for a solo tourist (80JD for 5 hr, 50JD for 3 hr). There was another solo tourist at the camp that day who was on a tighter budget and was considering skipping any tour totally as the prices were out of her budget, so I invited her along with me since I was already prepared to pay the full price and additional passengers on the same tour do not cost more. Of course, it’ll be more fun with someone else on board, especially since my ‘guide’ for the tour was the same driver who picked me up that morning and we haven’t gained much ground in establishing a common form of communication. 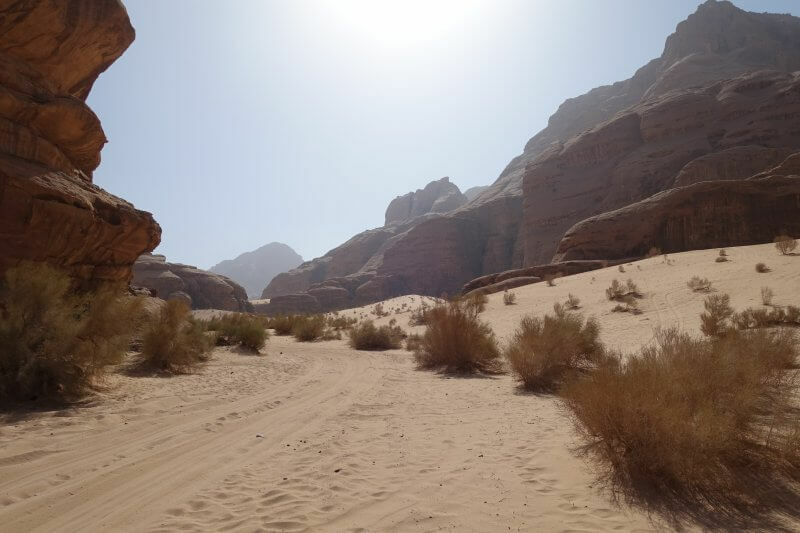 So after settling down and catching our breaths from the breathtaking scenery, we got back up on the pickup (well all the camps call it jeep tours but realistically they’re all on Hiluxes or similar) and were ready to conquer the desert like Lawrence of Arabia! Our first stop was to see the sand dunes. These weren’t quite what I expected as the mountains of pure, fine sand but rather, lots of sand piled high up against a mountain. Nonetheless a cool sight! 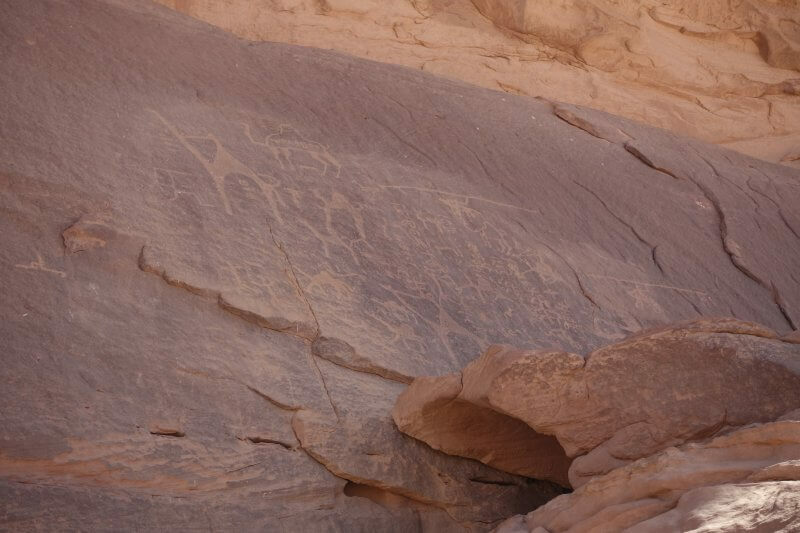 Next, some ancient petroglyphs known as the Alameleh Inscriptions. Not much can be found about them on the internet but they seem pretty famous. Honestly, I wouldn’t be able to tell if it had been recently carved by some vandal. Still, assuming they’re indeed centuries old, it’s pretty impressively preserved and detailed. Camel herders were gathering not far from where the inscriptions were. I could only guess what they were doing and what their camels were for. Some of the camels that were around the area. Nice backdrop for the camels. And off we went again. The explanations at each site was left to our own imagination, but it wasn’t necessarily a bad thing too. The fantastic, otherworldly landscape was a fertile ground for imagination. Reminiscent of the ‘dim sum’ buildings of NTU in Singapore. Another stop along the way. Artworks produced by water over time. Such a beautiful but at the same time terrifying place, much like my hike in Lapland, except this time I was in good hands. A couple more stops later, we stopped at one of the more famous (but less visually impressive) sights in Wadi Rum, Lawrence’s House, where Lawrence of Arabia supposedly once lived in. 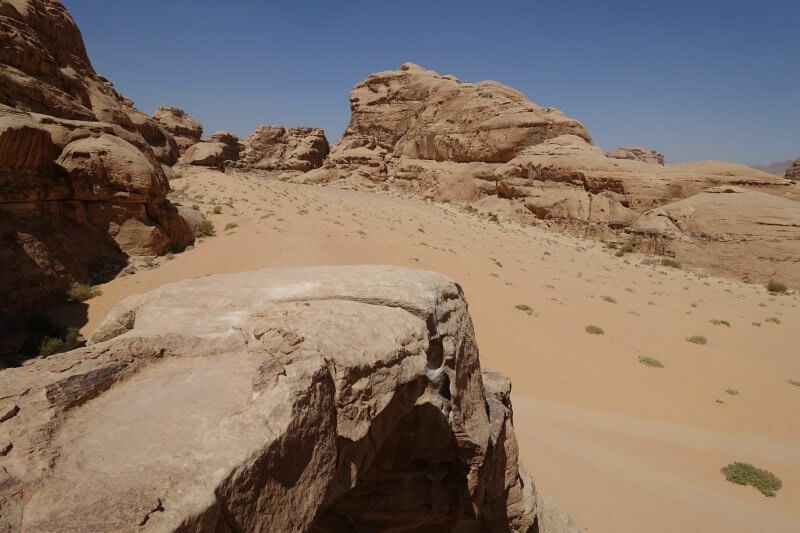 The surroundings were far more interesting though, such as the vast open desert-scape facing the ruins, or the tent where tourists and their guides stop for a rest, Bedouin style. Everyone was invited in, there was no pressure for payments, and ‘Bedouin Whiskey’ flowed freely. 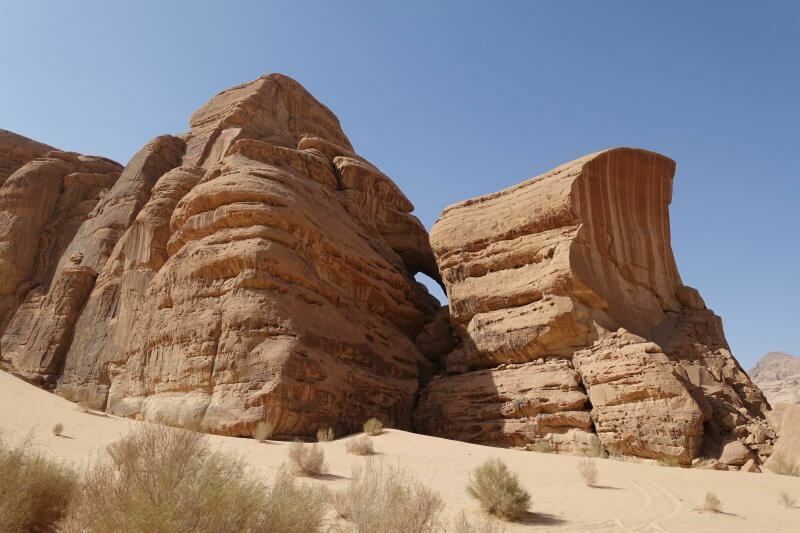 Bedouin Tea (or ‘Whiskey’) is made of desert herbs, black tea, and loads of sugar. It would have been nice without sugar but it’s a pity that what stands out most every time, is just the sugar. Or a joy, depending on your palate. 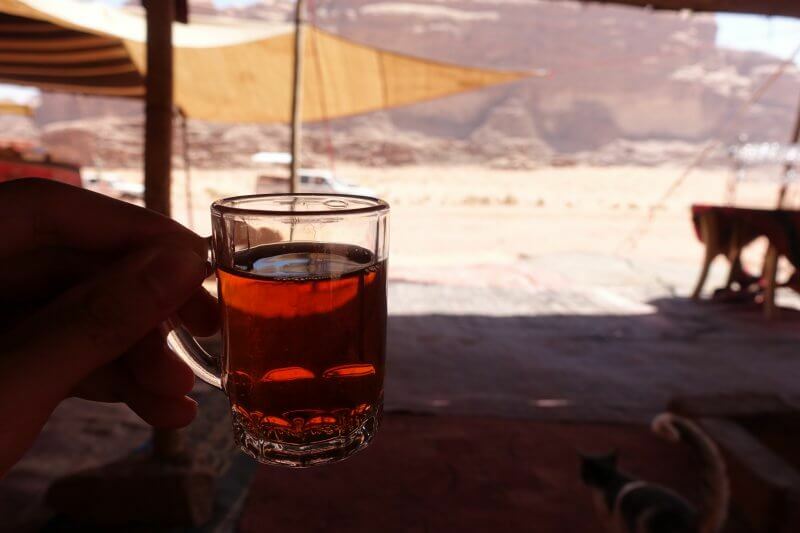 Enjoying Bedouin tea in a Bedouin tent. We had a long rest, a nice chat with other tourists, and way too much sugar at the Bedouin tent before we decided to continue with the desert tour. Heading all the way down south almost to the edge of Wadi Rum, we stopped at Umm Fruth Rock Bridge, where our guide left us to find our way to the top. Wouldn’t say that it’s as high as it looks, but as you can see from the next photo, still potentially vertigo inducing. 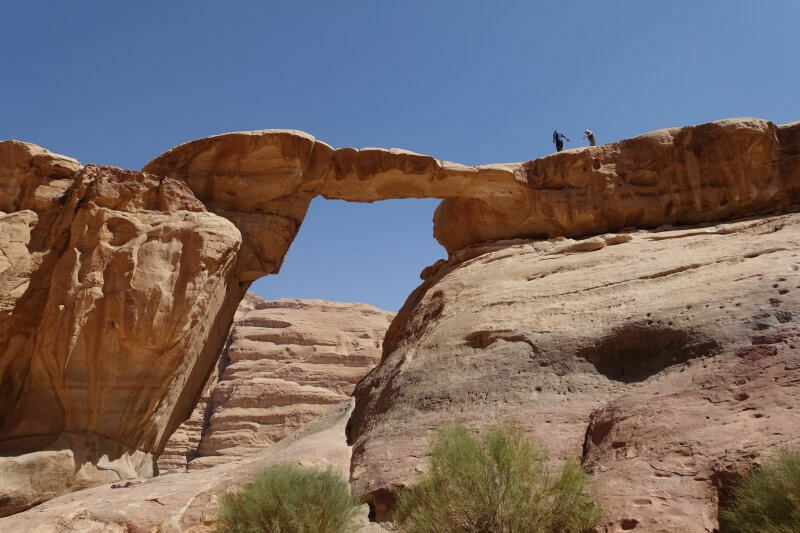 There are a few other rock bridges scattered around Wadi Rum which we didn’t stop to scale, only admired a few from a distance, which was a good idea too. This one high up in the mountains. By then we needed more reminders that we were still on Earth. 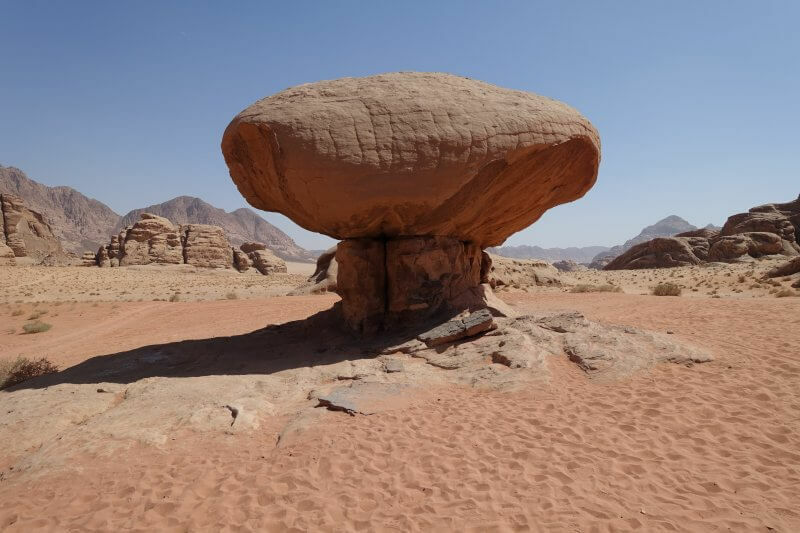 Alas that was not to be at the Mushroom Rock, fresh out of Mars. 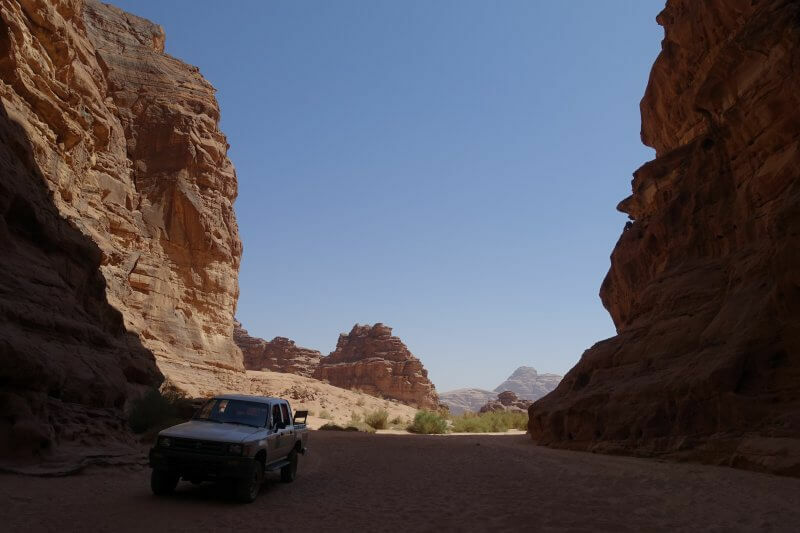 After miles in the open desert, we headed into a deep canyon. While admiring the change in landscape, the faint smell of cooked food floated through the air. 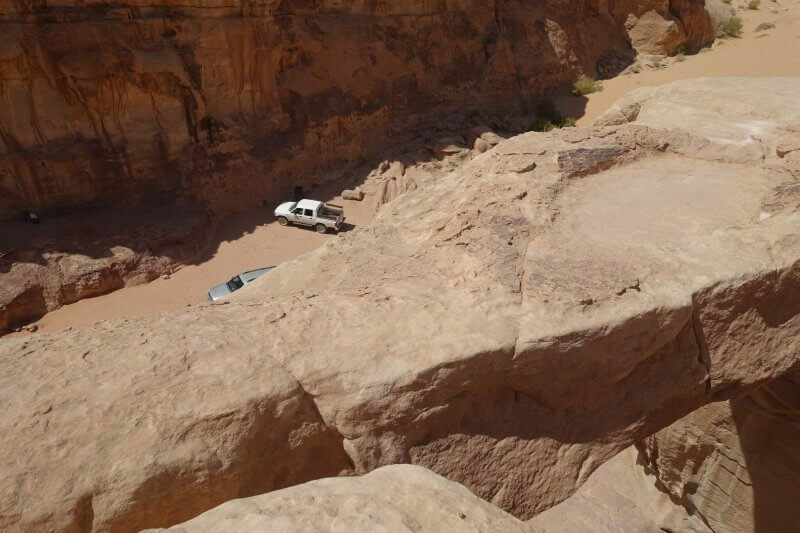 2 tourists from another jeep were having their lunch at this sheltered corner of the desert, their guide having cooked it right there. They invited us over as there was still plenty of food to spare, and our guide contributed with some freshly brewed Bedoiun tea. 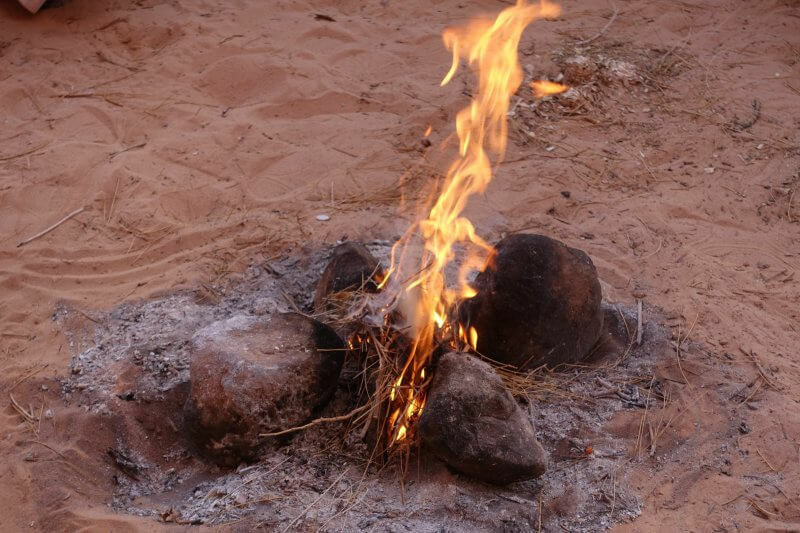 Fire for cooking lunch and preparing Bedouin tea. 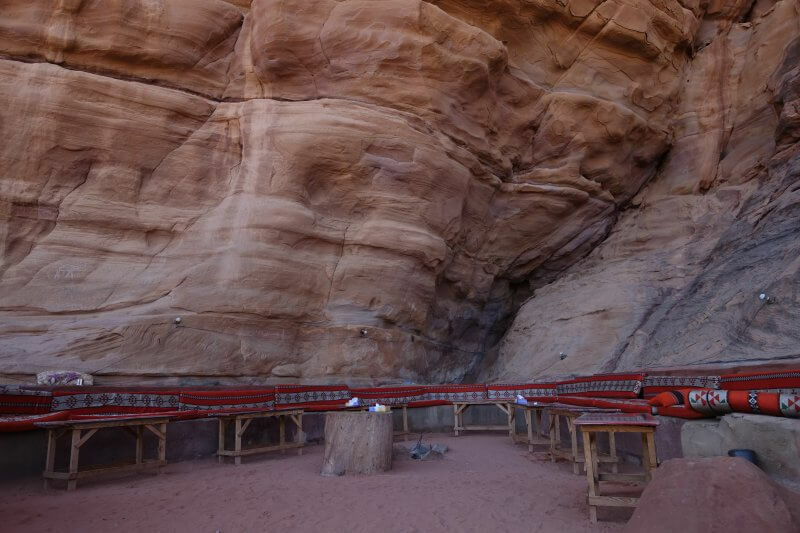 It was quite an experience having a picnic of hot food in the canyon. We were also getting a little hungry by then. 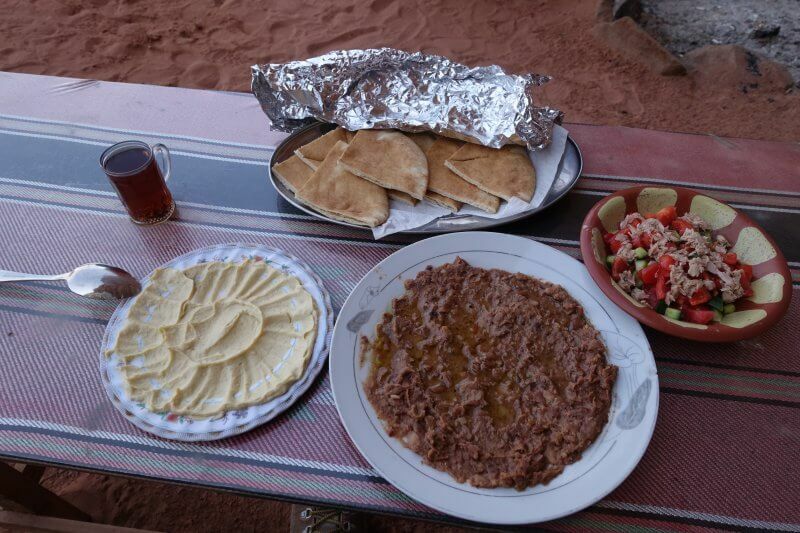 Typical lunch prepared for guests in the desert. After the food tasting in the unique setting, and another nice chat with fellow tourists, we were off again! Desert ‘roads’. Soft sand all the way. Another rock bridge high up. Through another canyon, the sun shining brightly. 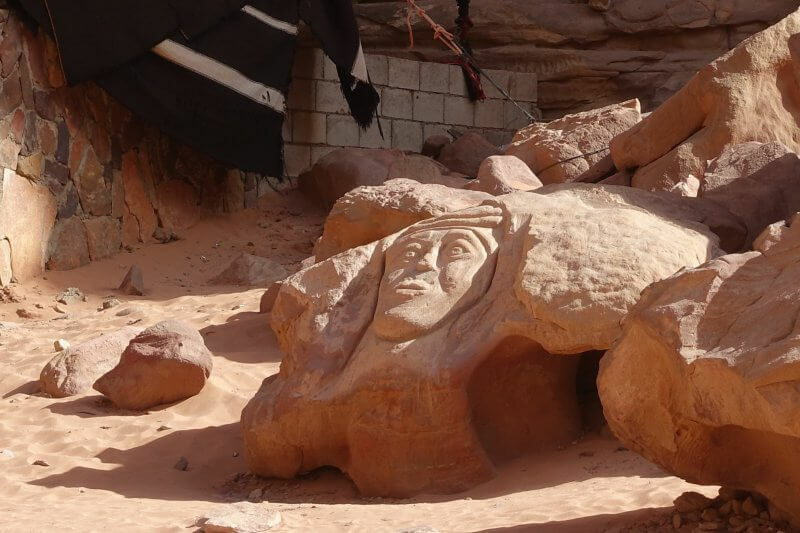 Our final stop was at Siq Um Tawaqi, known for the carvings of T E Lawrence. Our guide invited us to the tent nearby to have more tea, but we’d had enough sugar for the afternoon, and politely declined. 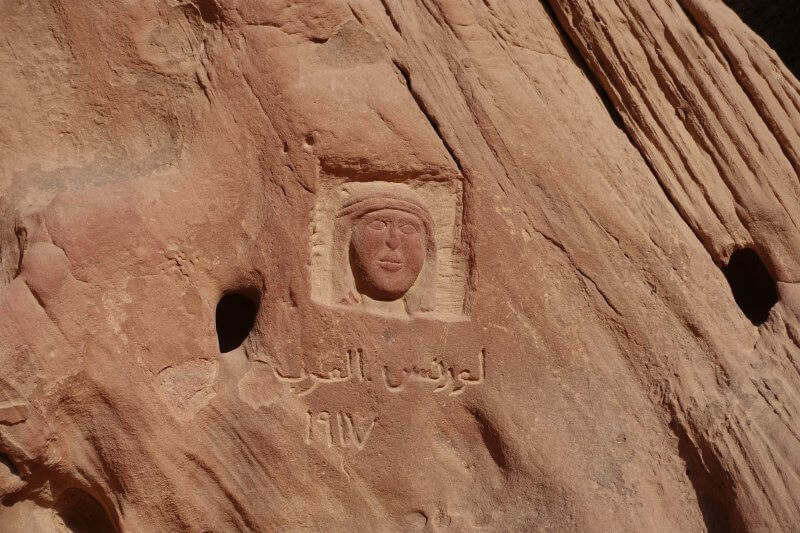 One of the carvings at Siq Um Tawaqi. The pickup (jeep?) against the desert mountains. We were getting tired then from bumping around in the pickup under the sun, and just about the right time to head back to camp for lunch. Lunch was not provided so I got this for 7JD. Not exactly cheap but there wasn’t much of a choice out there. If you’re on a budget it’ll be a good idea to pack some food for lunch. 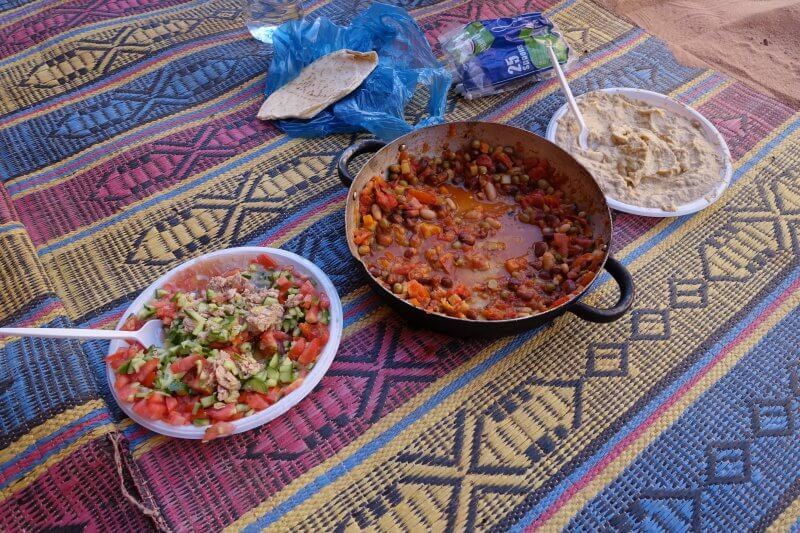 The lunch was similar to the meal we had in the canyon, tasted good and more than enough for a person. Flat bread, hummus, some smashed beans, tuna/ tomato/ cucumber salad. Lunch at Salman Zwaidh Camp. What was left of the afternoon passed quickly with lunch and some scrambling around the rocks at the campsite. As dusk neared, the driver/guide got us out to catch sunset. 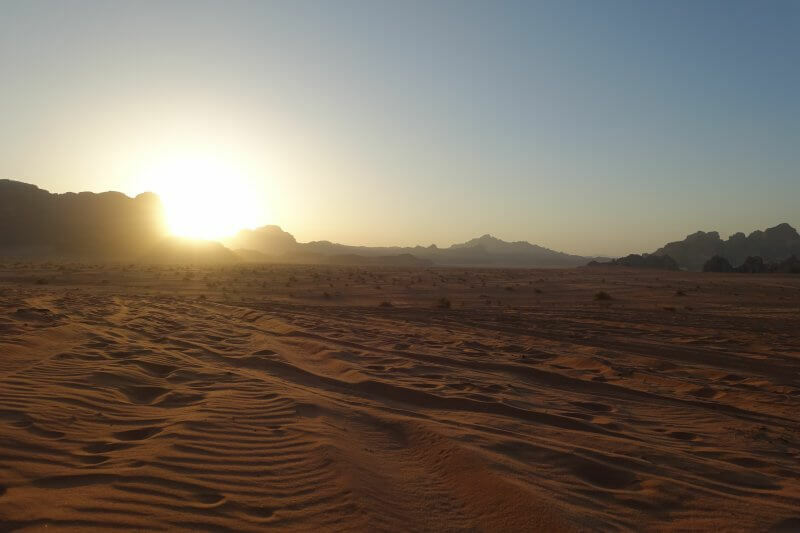 Coming from Singapore where tall buildings surround everywhere, it was surreal watching the sun setting over the grand vastness and emptiness of the desert. Where we were seemed like a popular sunset spot with many tourists from other camps gathered there too. Back at camp, dinner was waiting. It was a splendid spread, considering that there weren’t that many guests that night. Salads, hummus, beans and flatbread were the usual suspects, but the chicken biryani (not too sure what it was called, chicken and rice all cooked together) was immensely flavourful and definitely the star of the night. We had our fill in a snugly seating corner on one side of the rocks, under a sky of endless stars. After dinner, I wandered just beyond the camp, where ambient light was much dimmer. It was a jaw dropping sight, with every corner of the clear night sky filled with stars, flickering and shining from billions of light years away. I experimented with some photos, but will come back to them later. 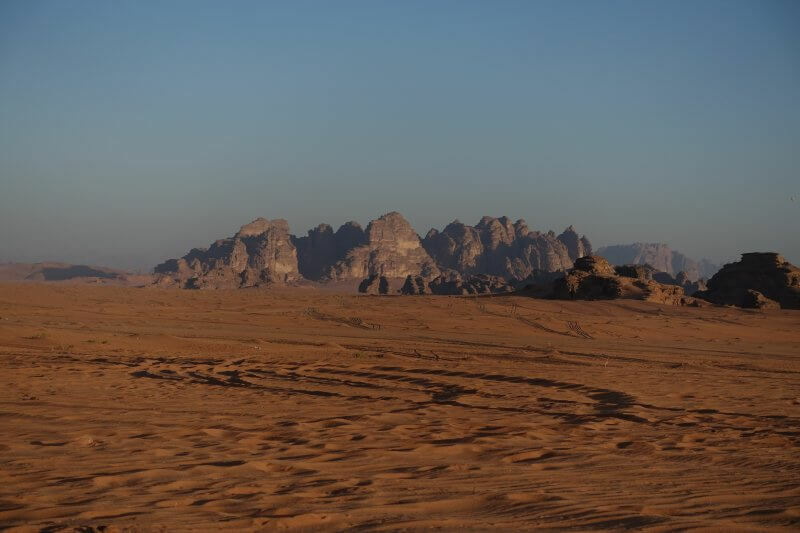 By the time I got out of bed and my tent, the sun had risen, and what was left of an earlier party of sunrise watchers were the dying flames of an earlier campfire (which I’m sure was used to prepare Bedouin tea again). Warm fire, hot tea, morning sun and yoga. Nonetheless not too late to have some fun with light and shadows. A big moment for me. Shifting sands in the morning sun. 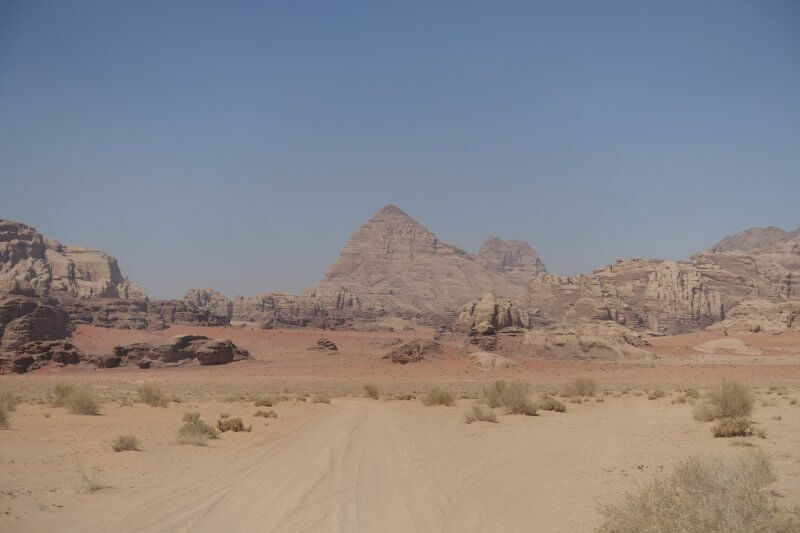 Desert city … of rocks. Most people stay in the desert just for a night but as I had decided to take it slow and stay for 2, I had a full day for reflection in the desert. 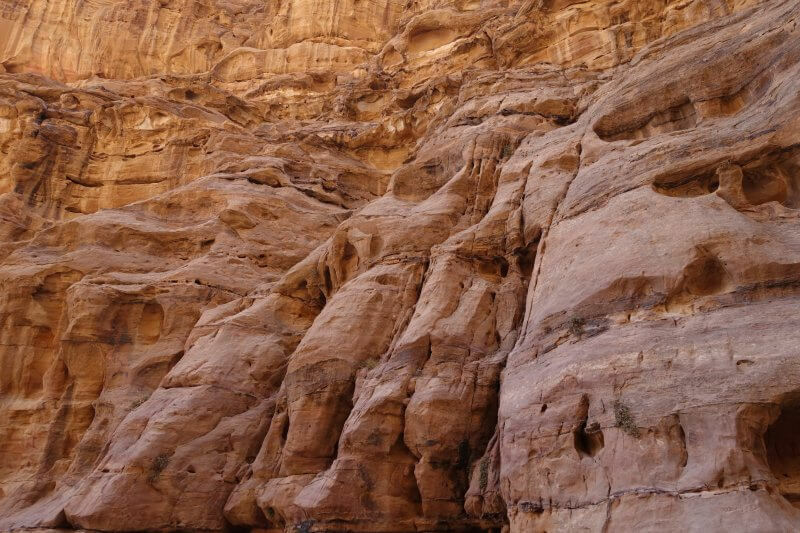 Not too bad considering the amount of hiking I had just completed in Petra. 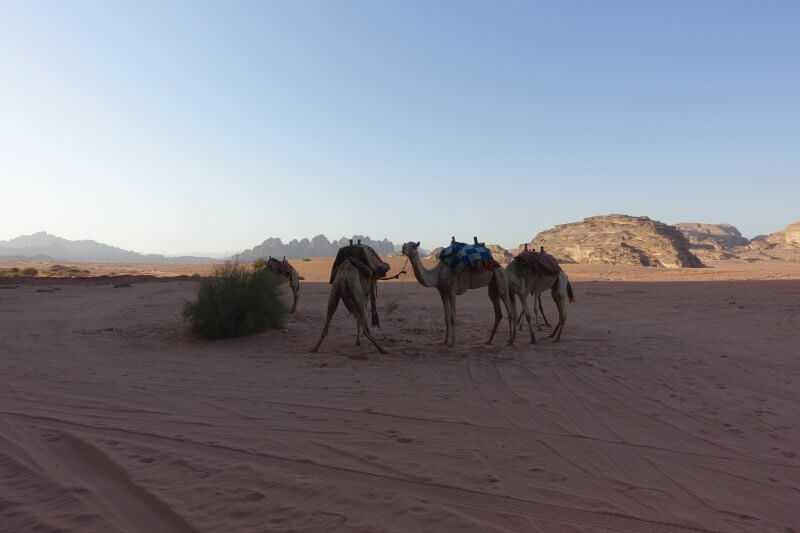 There was to be a camel ride in the afternoon, and most of the morning was quiet after the other guests left the camp. Late in the morning, many little red birds dropped by the rocks on the side of the camp. I found out later that this was the Sinai rosefinch, the national bird of Jordan. 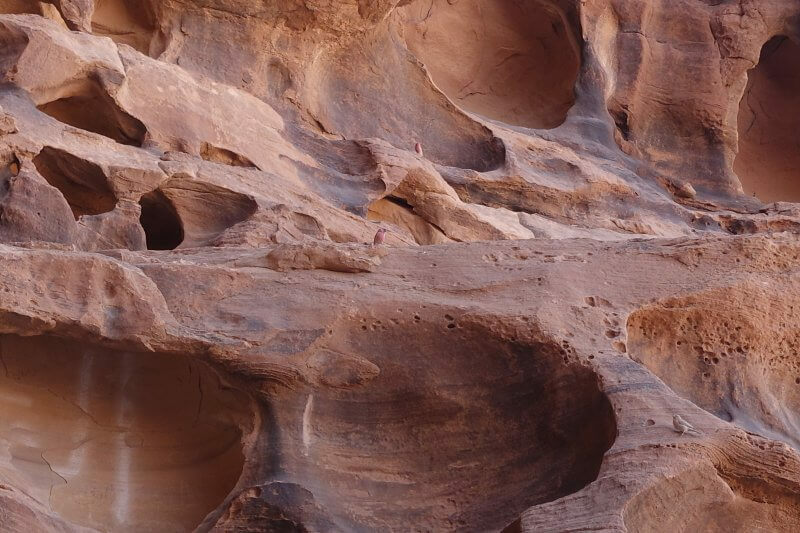 I was intrigued and mesmerised by their calls as they fluttered from crevice to crevice. 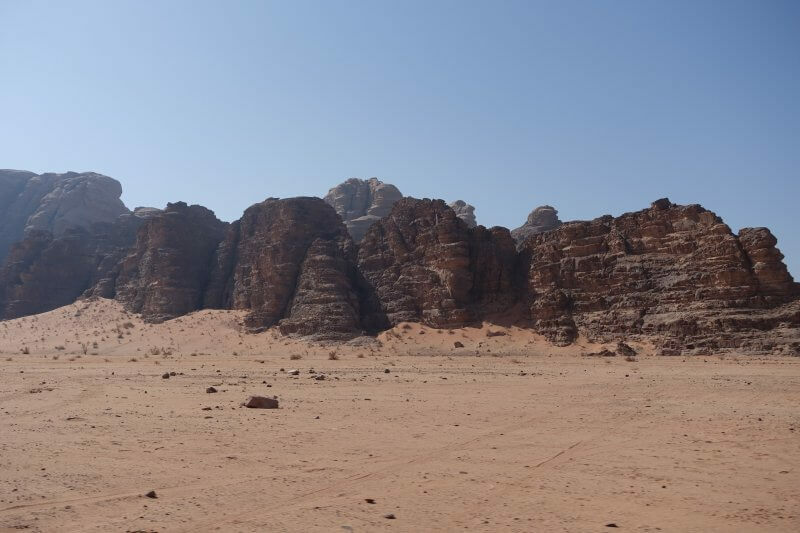 Unfortunately I couldn’t capture the essence of their song and you’d have to drop by Wadi Rum to experience it yourself! 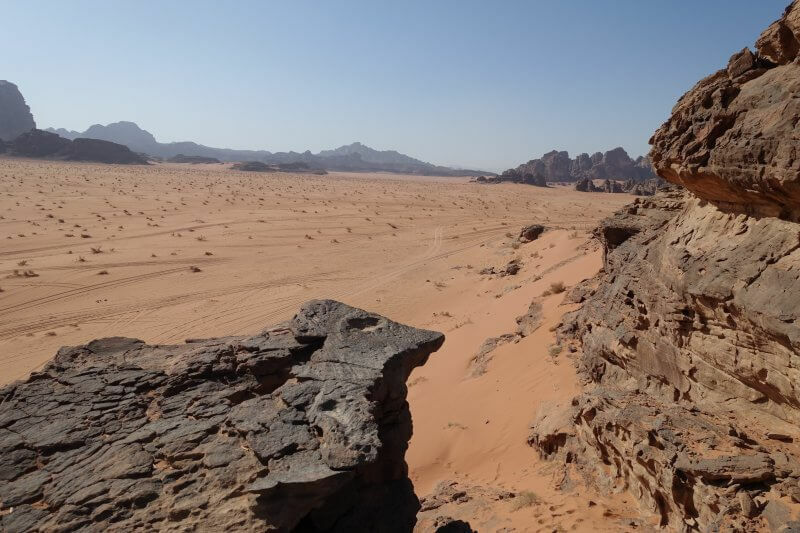 In the afternoon, more guests arrived and I thought it might be a good idea to join them in venturing further beyond the camp, to a huge rock formation in the distance. Looking badass in the desert. Bootprints. Thinking back, walking barefoot in the soft sand would have been a good idea too. Waiting for giant alien monsters to leap out from behind these huge rocks. Or for the rocks to turn into giant alien monsters. Scaling the huge rock, looking back. Would have been a nice spot to watch a battle. 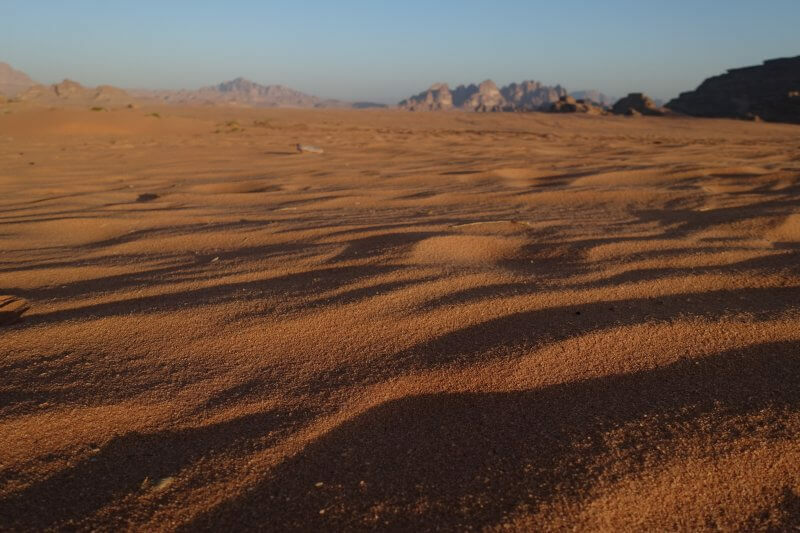 But alas, the only movement across the open desert was the occasional whisper of the desert breeze. From the other side of the rock, a quiet spot for meditation. 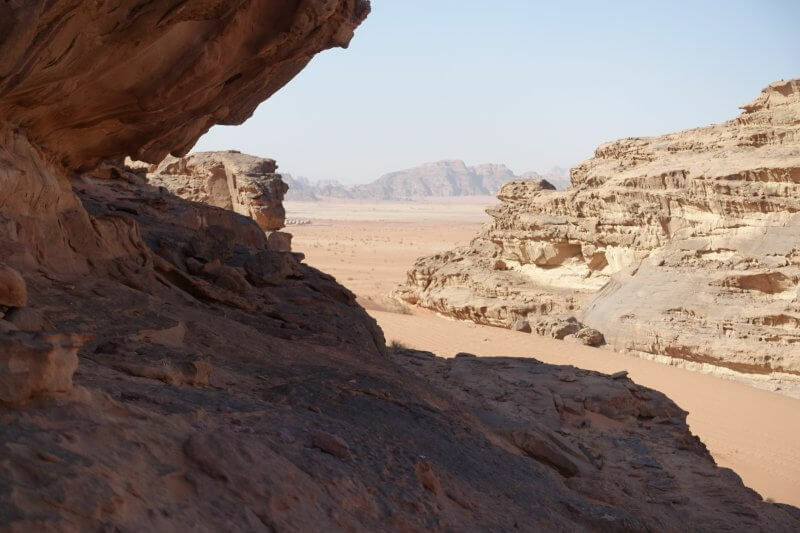 Or to ambush camel caravans passing through the narrow valley, if it were hundreds of years ago. 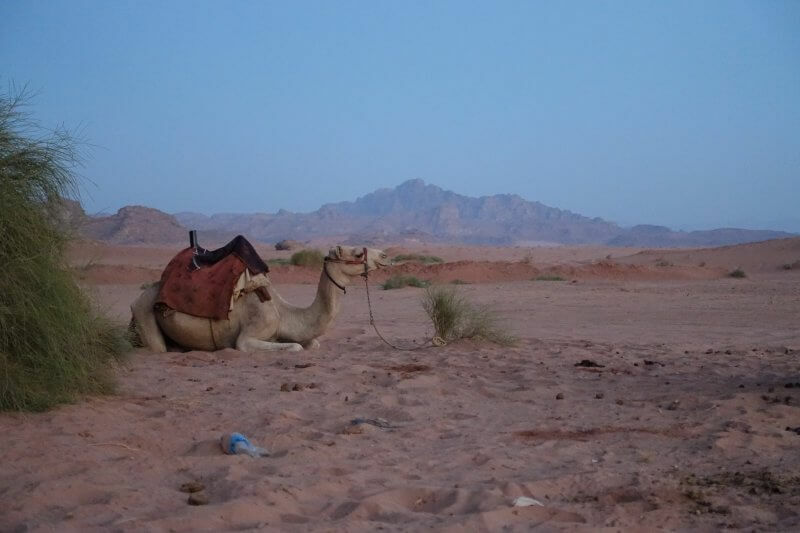 I signed up for a 2 hour camel ride (15JD per hour) and was prepared to finish it before sunset that day. However, due to miscommunication, unfortunately or not, it became one hour before sunset and one after. I thought it would be a terrible idea to ride this wild desert beast in the darkness, but failed in communicating that idea to the camp staff, and had to obediently accept the plan. Camels waiting outside the camp. 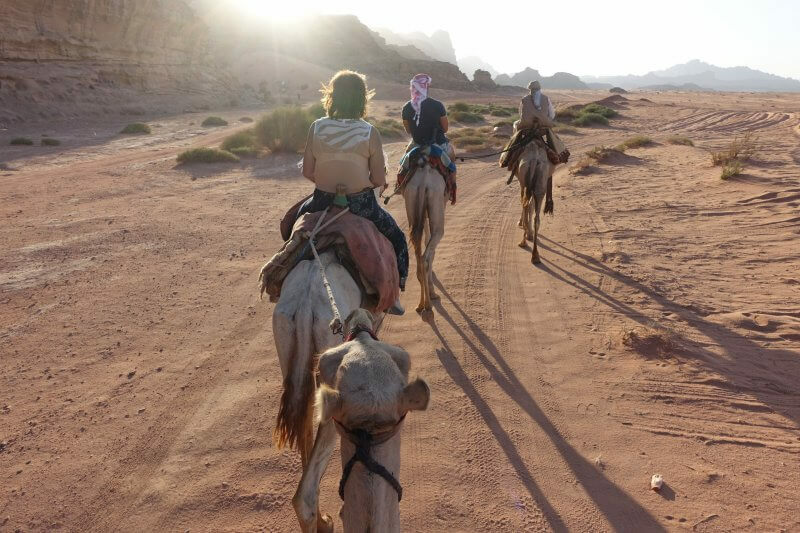 With my newfound friends, I was up on the camel, striding steadily towards the slowly setting sun. 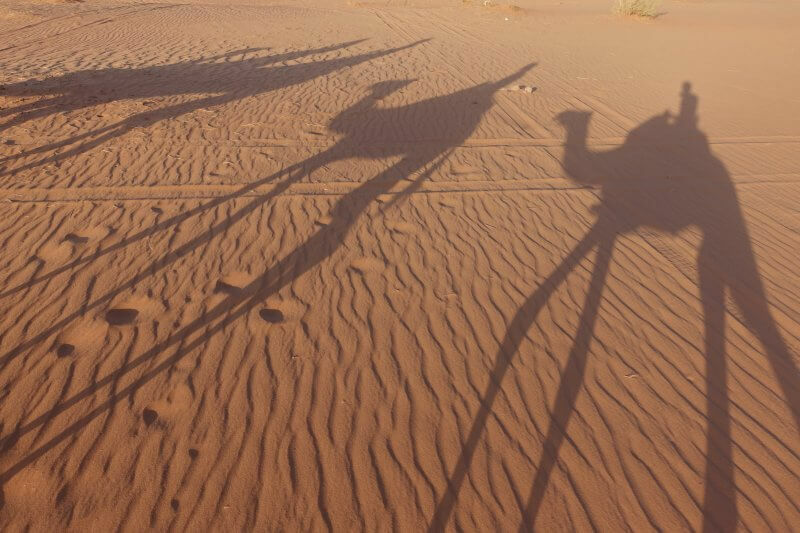 The camels were tall, and it was terrifying the first time the camel stood up with me on its back. 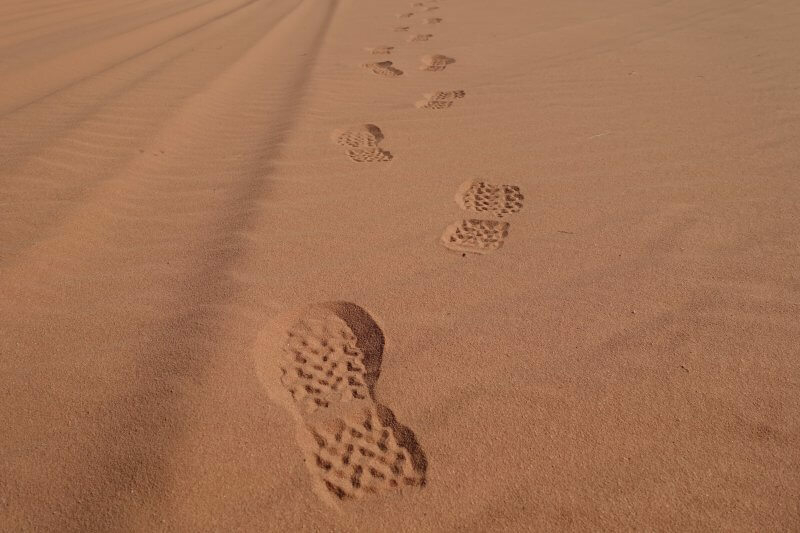 Camels don’t quite gallop, but instead take steady steps, one at a time. At least while carrying tourists. There are other camels that are used for racing and I’m sure they don’t move like this to win races. We zigzagged around the dunes and ended up at another spot to catch sunset. In all seriousness I wasn’t able to tell if it were the same spot as the previous day as much of the desert looks very similar to the untrained eye, even with the unique rock formations. 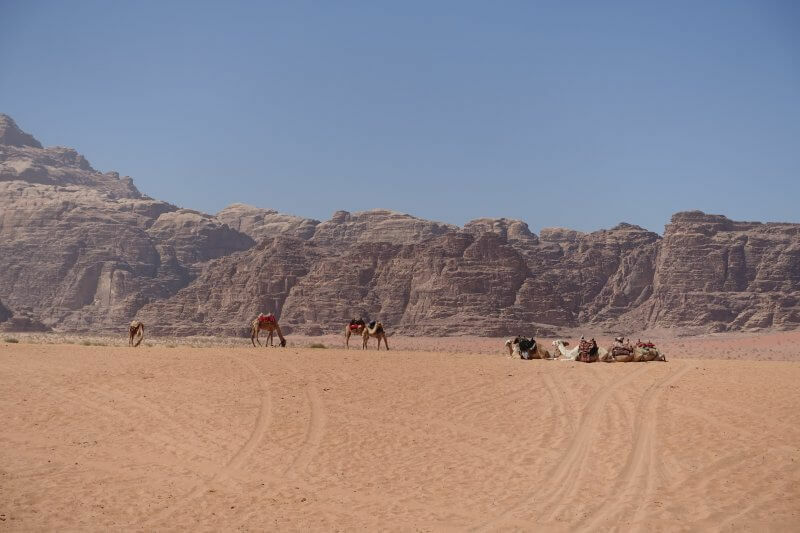 We got back on the camels to continue our tour. Light grew dimmer by the minute, and all the earlier amazement faded with the disappearing light as my attention shifted from the surroundings to the seat I was on. 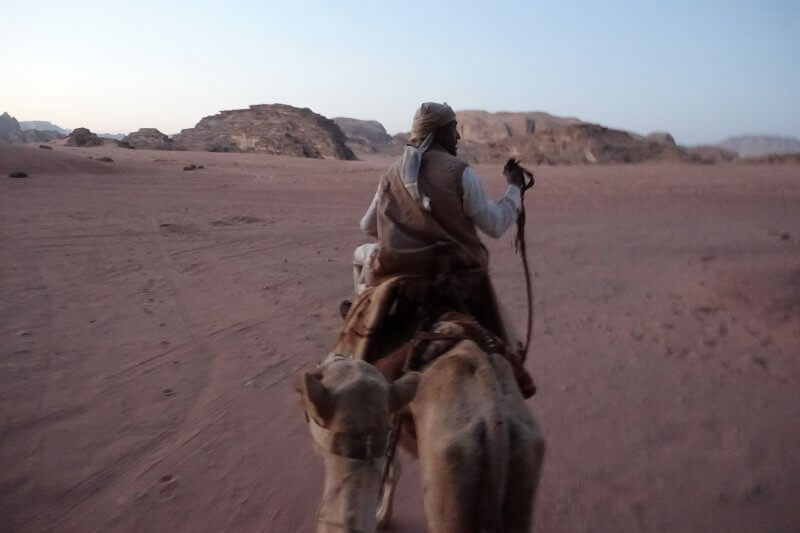 It became apparent (or by a figment of my imagination), that my seat was slanting to one side and I was sliding off the camel. Not a very enticing prospect, given that I was 2 meters from the ground. I clung on tighter. Wasn’t looking good. No more light for pictures, and barely hanging on for my life. Riding off into the night. Just as I was starting to despair, I looked up, and all the uncomfortable thoughts suddenly disappeared. 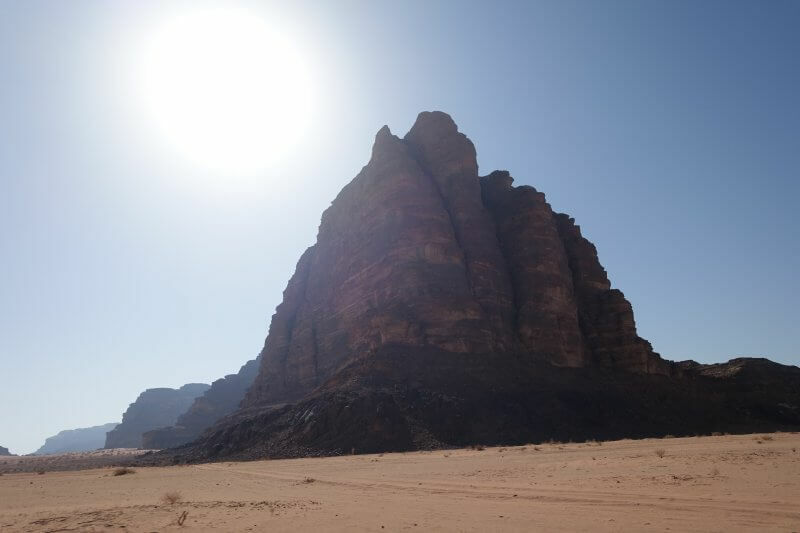 In the moment I was distracted, the fading sunset sky had turned into a blanket of the brightest stars, just as the previous night, illuminating the way as the camel strode confidently on, making hardly a sound on the soft sand. 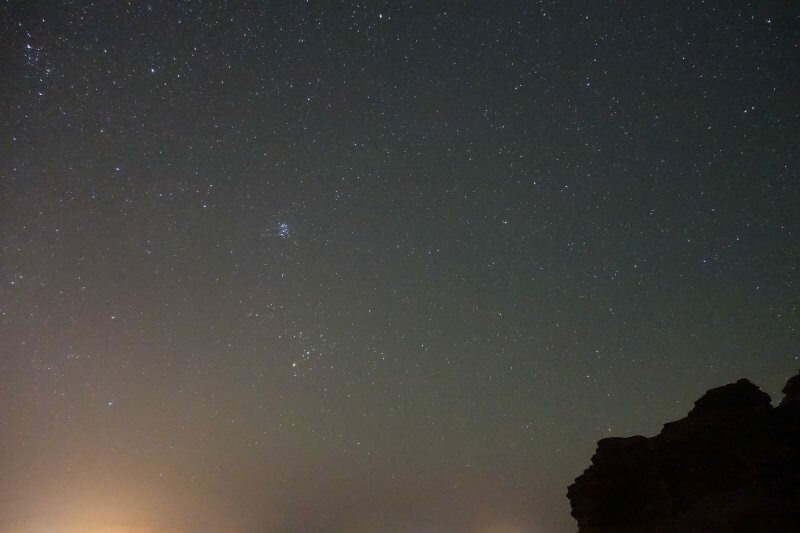 It felt like the most magical experience ever, stargazing while camel riding. No pictures could be taken, nor would any be necessary. I felt light, no longer sliding off to the side, and in total awe of the surreal experience. Nothing could have, or would have, prepared me for it. For once I was glad that the camp staff did not understand me. Dinner was a social affair, mingling with the other guests over a meal just as sumptuous as on the day before. 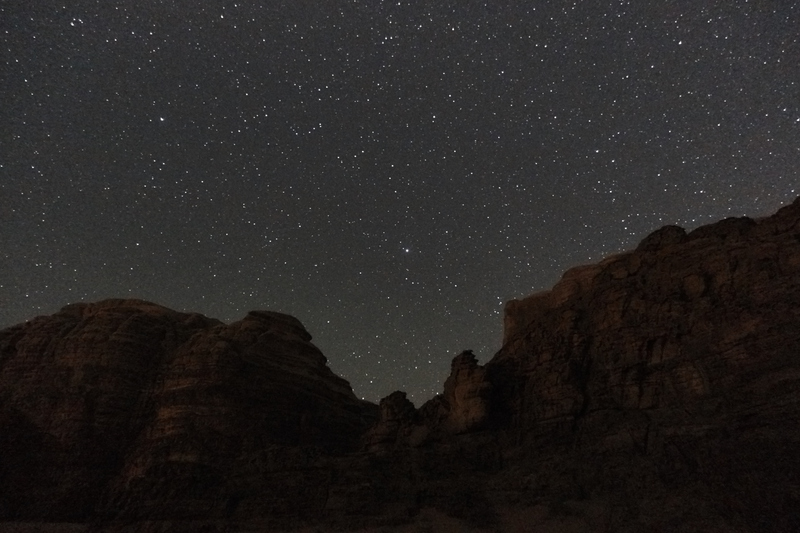 As it turned out, some of the other guests were interested in experimenting with astrophotography in the desert too, and we set off to get further from the camp lights, closer to the starlight. One of the guys from the camp came with us, setting up a campfire and making what else, but Bedouin tea. 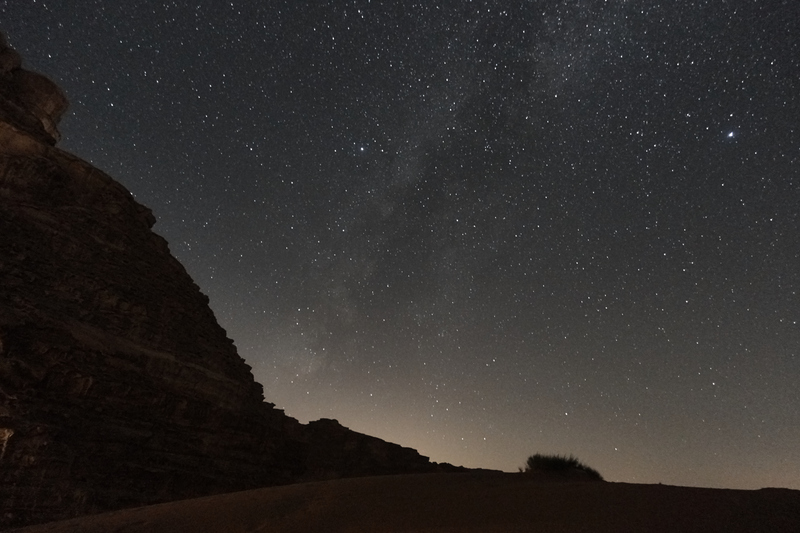 The Milky Way from Wadi Rum. We had to wait some time for it to ‘shift’ into position from behind the rocks. Clusters of stars, unedited. Not sufficiently trained in astronomy to read it, would appreciate any help in decoding this! The final shot of the night. Time to hit the road again. 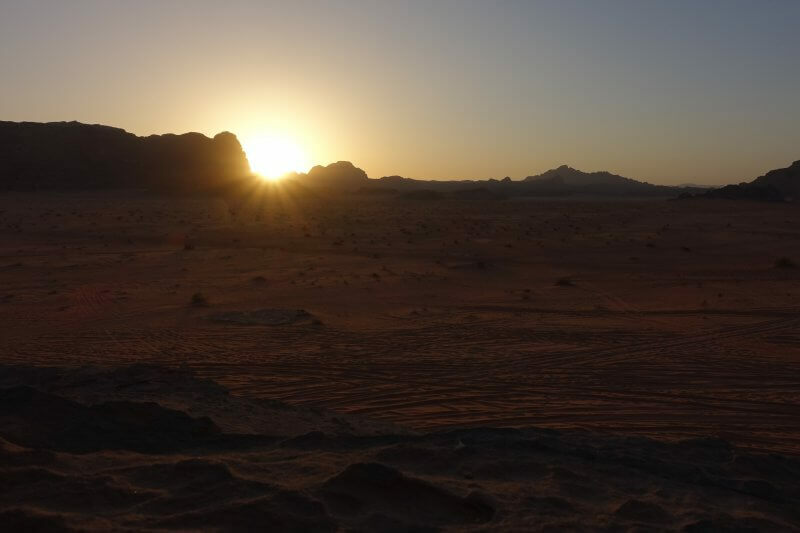 I woke up early to finish breakfast and catch the morning bus to Aqaba, where I would continue my Jordan adventures. I was all ready and packed, but breakfast nowhere in sight. Turned out the guy probably had too much fun the night before and overslept. After breakfast, the driver from the first day rushed to get me out of the camp to the bus. We caught it, but it was full. 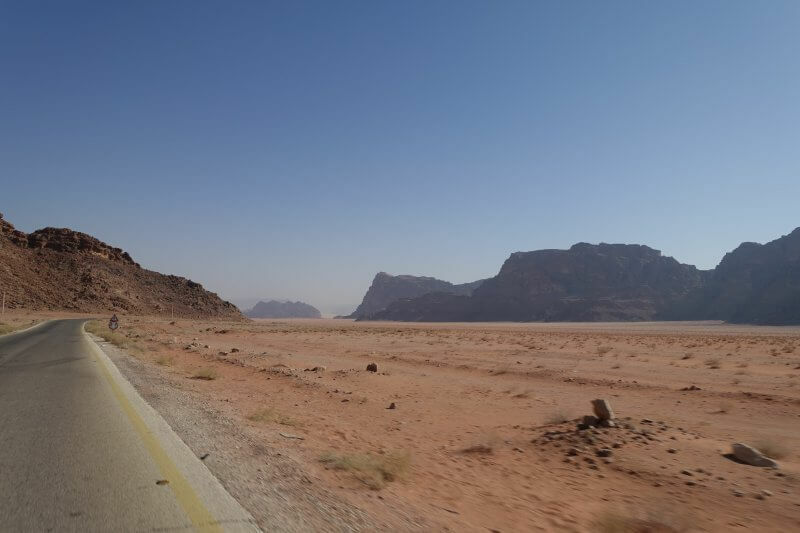 A billion thoughts rushed through my head, but few offered solutions on the next plan to get to Aqaba. Back to camp to figure something out. For the early morning camel riders. 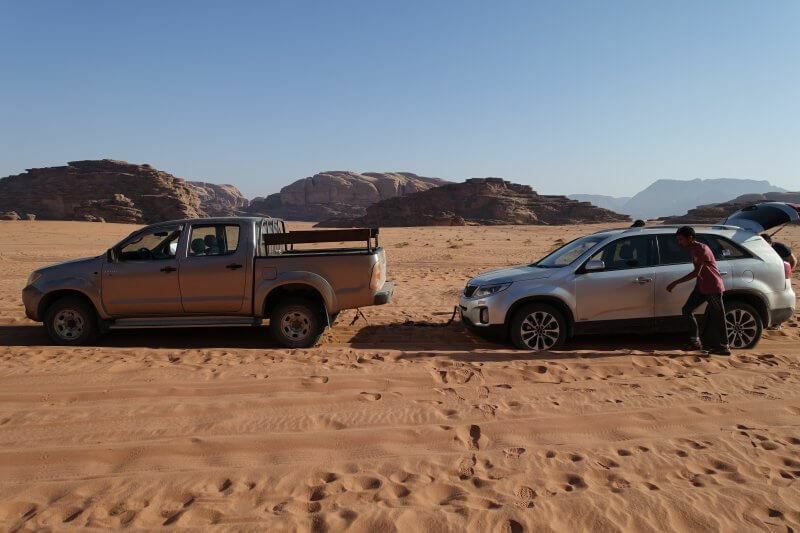 As it turned out, a couple back at camp were heading to Aqaba too, in their rented car. I was very fortunate for their generosity as they offered me a lift. There was a slight problem though. 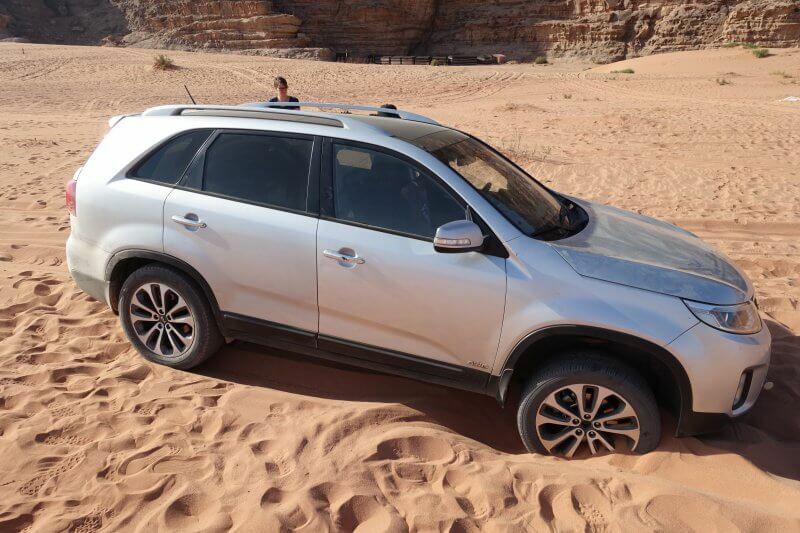 Despite their car being and AWD, it didn’t handle the soft sand very well, and they had gotten stuck once on the previous day. 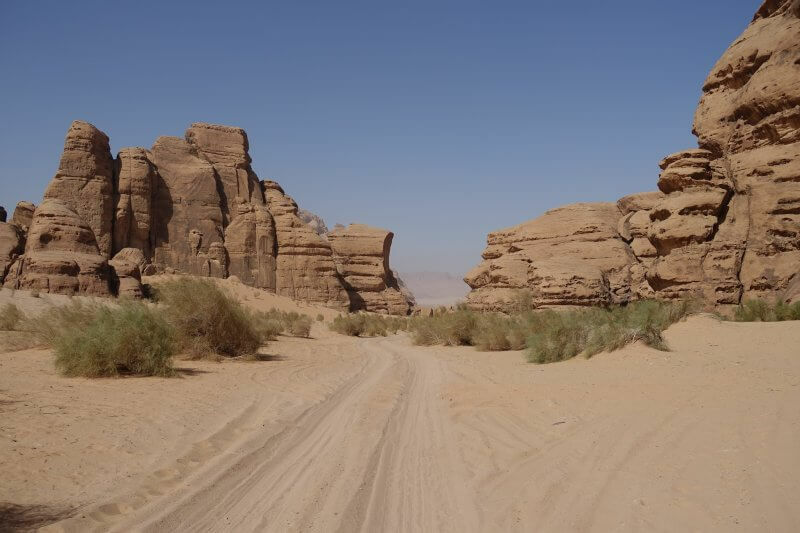 They got the driver to lead the way out of the desert to the main road, repeating that they needed to avoid the soft sands at all cost. In English, of course. There could only be one outcome, but somehow we did not see it coming. 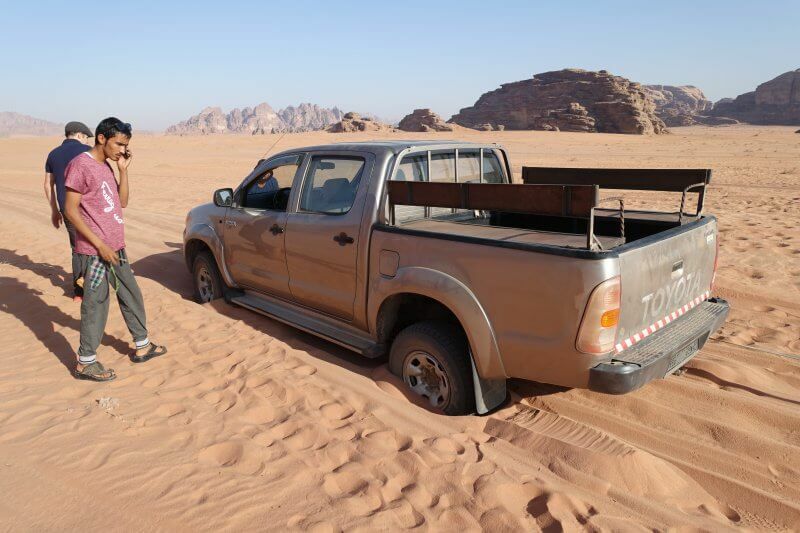 It turned out to be quite an experience trying to free the car from the soft desert sand. A rope we used to tie the car to the truck broke, and we were on the brink of getting the truck stuck as well. In the end, another staff from the campsite came running over to help (yes we were that close). We let out air from the wheels, and he ingeniously found scrap pieces of plastic and wood to stuff under the wheels. After lots of heaving and pushing and shouting, the car was finally free! Definitely the adventure to end off an adventure. 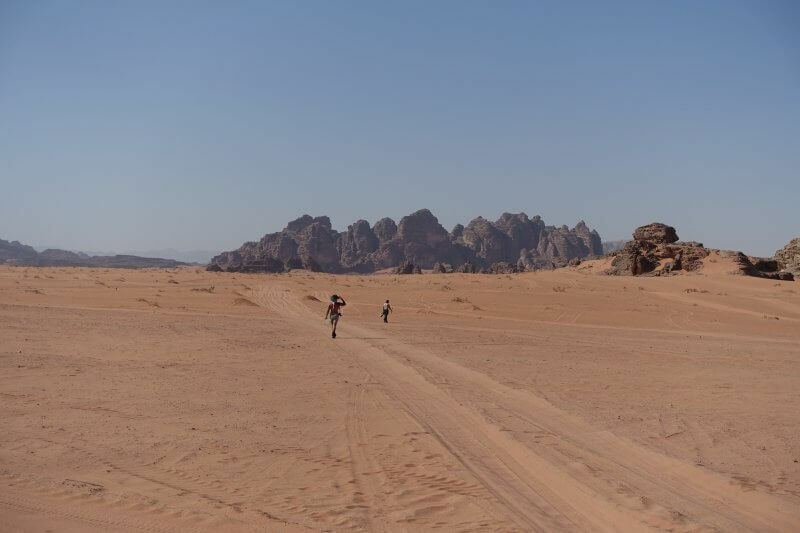 We proceeded cautiously via another track to the paved road, and onward to Aqaba, screaming along to the radio like we’ve just conquered the world. 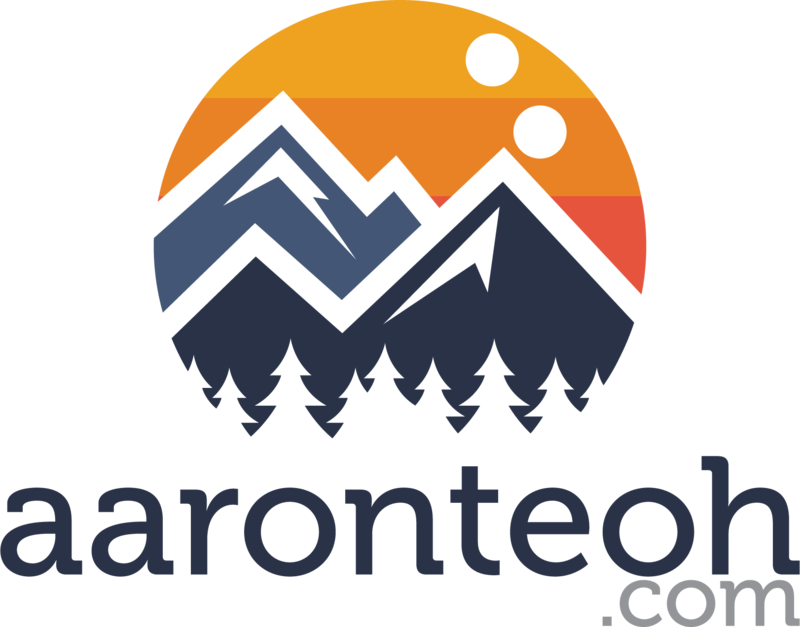 Amazing write up and experience! Thank you for sharing! 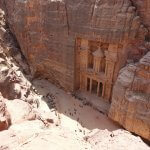 I am planning a trip to Israel and Jordan and stumbled onto your site via a google search about Petra trail distances. Now I’m reading all the articles haha! Your website is super helpful! 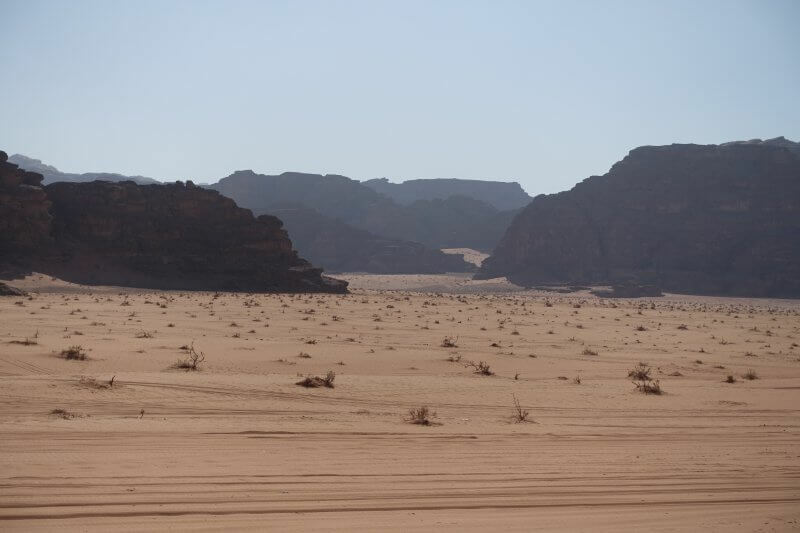 I am heading to Jordan this coming early Dec probably a week? I have no itinerary plan out yet, am flying in to Amman and out from Cairo back to Singapore (16 days in total). 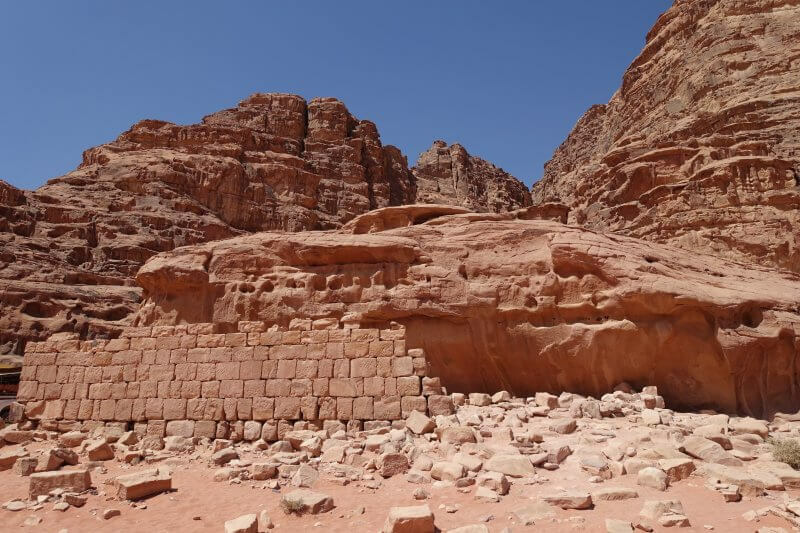 Would you be able to share your itinerary in Jordan and the rough cost? I am a budget traveller, solo. 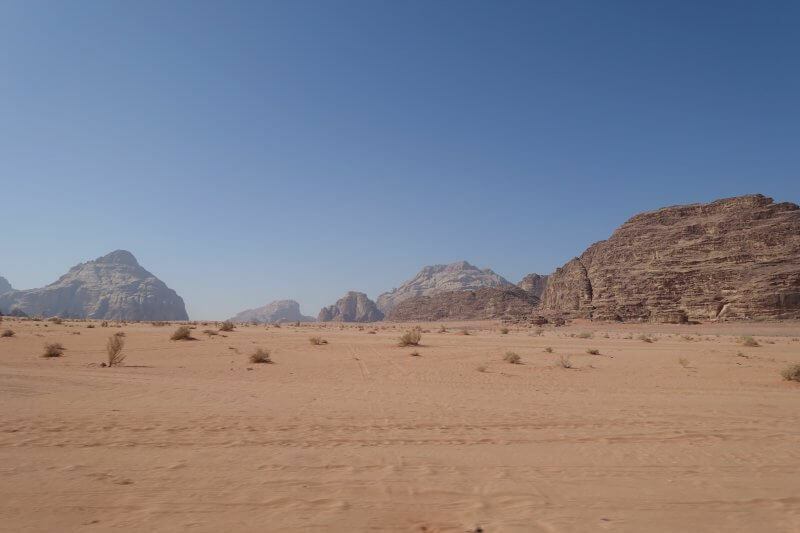 If I had to pick the top things to do (since you have less time), it’ll be Petra, Wadi Rum, Amman and Jerash. 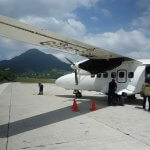 So basically other than private transport, costs are relatively manageable for budget travelers. 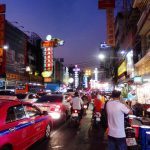 Not a cheap destination, but still an amazing one. Have a great trip!